Socialization is an important feature in any young puppy’s life because it is essential for open-minded young dogs to understand that other dogs do not pose a threat. 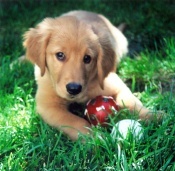 It also enables them to learn how to play properly without causing harm to other dogs and people alike. It can help to reinforce the message that you have been teaching to stop puppy biting, especially if done within a confined and controlled environment. Dogs need an early education for proper development, so you might find puppy training tips useful in your endeavor to raise a dog that is happy, healthy, obedient and friendly. This is especially true if you are a first time owner. You’ll want to stop puppy biting as soon as it starts to prevent your dog from thinking this type of behavior is acceptable. It is natural for puppies to freely and frequently use their mouths on anything and everyone they come in contact with. This is because it is through their taste and their teeth they learn and experience. Biting is also how they communicate, play and test their fellow litter mates. However, even if this is part of their instincts, that doesn’t mean you should allow it. You can stop puppy biting by putting one or more of the following techniques into practice. It is not difficult to provide your pooch with basic puppy care. This is because all that is required are the necessities a dog needs in order to be happy and healthy, so he can develop into an obedient, devoted and loving companion. In fact, you’ll probably find that most of it is simply a matter of common sense. If you plan on traveling with your dog, you need to make sure that you have everything he requires to ensure he has a fun and safe trip. You need to ensure the accommodations you’ve selected will permit your pet.